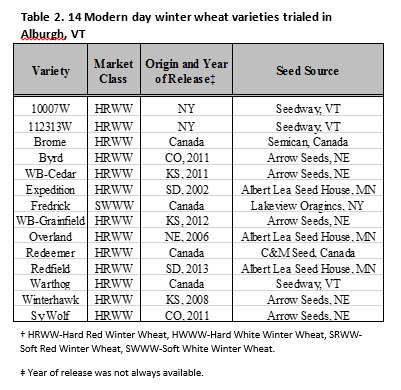 This year, the University of Vermont Extension Northwest Crops and Soils team conducted an organic hard red winter wheat variety trial–both heirloom and modern day varieties–to determine those that perform best in our northern climate. The following provides harvest results from the trials at Borderview Research Farm in Alburgh, Vermont. 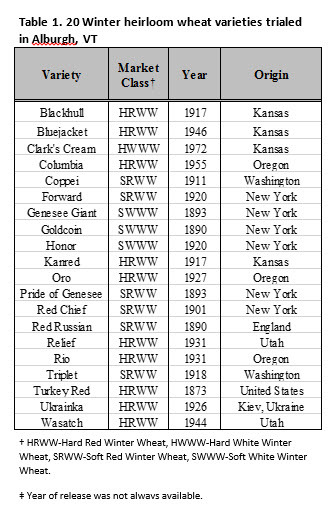 The project evaluated 34 winter wheat varieties: 20 Heirloom (Table 1) and 14 Modern-day (Table 2). The experimental plot design was a randomized complete block with three replications. The seedbed was prepared by conventional tillage methods and the plots were managed with practices similar to those used by producers in the surrounding area. The soil type was a Benson silt loam soil. The plots were seeded with a Great Plains NT60 Cone Seeder on 25-Sep 2015 at a rate of 350 live seeds per m2. The plots were harvested with an Almaco SP50 plot combine on 21-Jul 2016; the harvest area was 5’ x 20’. The highest yielding variety was 112313W at 4,336 lbs ac-1 (Table 3). Other high yielding varieties include: Byrd (4,090 lbs ac-1), Forward (3,966 lbs ac-1), Winterhawk (3,616 lbs ac-1), WB-Cedar (3,524 lbs ac-1), 10007W (3,507 lbs ac-1), Brome (3,484 lbs ac-1), and Fredrick (3,411 lbs ac-1). The lowest harvest moisture was 1007W at 15.1% moisture and the highest harvest mois-ture was Brome (20.8%). All of the varieties were above the 14% moisture and therefore had to be dried down for before storage. The variety with the highest test weight was Expedition (62.8 lbs bu-1). Out of the 34 varieties trialed, 28 of those met or exceeded industry standard for test weight. Additional quality measurements–protein, falling number and DON concentration–are currently being evaluated for these varieties. We will continue to com-pile data from this and other trials; results will be posted to our website at www.uvm.edu/extension/cropsoil/research. For a pdf version of the information in this post, please visit the Northern Grain Growers website at: http://northerngraingrowers.org/wp-content/uploads/2016-WWVT-Pre-Results.pdf. This entry was posted on Wednesday, August 31st, 2016 at 3:53 pm and is filed under Out Croppings, Uncategorized. You can follow any responses to this entry through the RSS 2.0 feed. You can leave a response, or trackback from your own site.